Kron & Card LLP can assist you in forming any number of different business entities, including but not limited to general and limited partnerships, limited liability companies, C-corporations, S-corporations, non-profit organizations, Statutory Cooperatives, and Collectives. While creating a new business entity or transitioning from one type of entity to another may seem to be a simple process, it is imperative that you be adequately informed as to the rules and regulations affecting corporate formation and governance in order to ensure limited liability as well as promote real growth and profitability. Formation of new business entities is just the first aspect of Kron & Card LLP’s corporate practice. Once you have incorporated your business, it becomes critical that corporate records are maintained, rules and regulations are continually followed, and certain corporate formalities are observed. 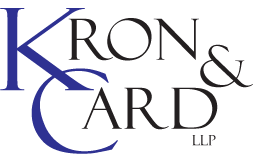 Kron & Card LLP has several corporate clients for whom its sole responsibility is to ensure the observation of all necessary corporate formalities through the implementation and monitoring of a structured set of business practices and procedures. Kron & Card LLP advises clients in a broad range of corporate transactions, including formation, operation, and transactions such as buying, selling, or merging existing business entities. We represent clients across many different industries, including entertainment, construction, service, and health & wellness.